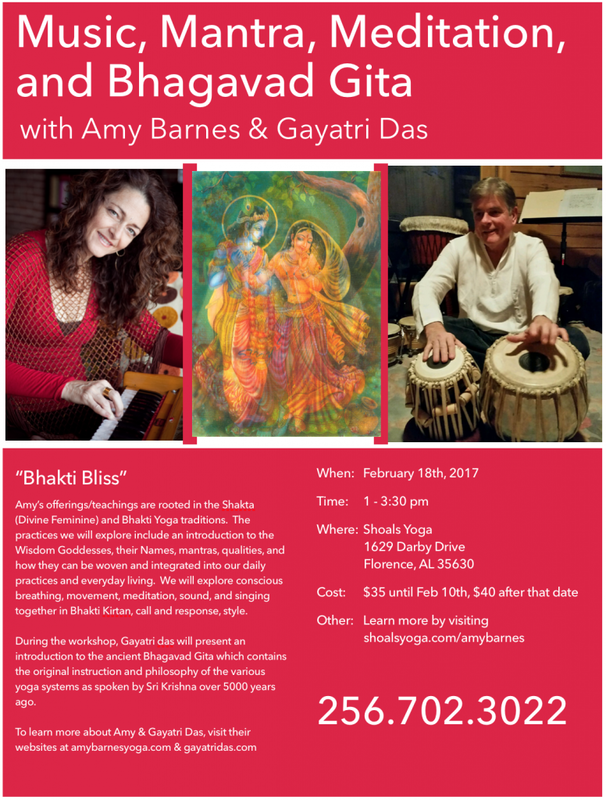 I am particularly excited about collaborating with my dear Bhakti brother Gayatri das for this workshop at Shoals Yoga. Thank you Danielle Snoddy! I am grateful that we have the opportunity to share our many years of practice and study with ya’ll down in Florence, AL. I am deeply drawn and connected to your Singing River, the mighty Tennessee. The history and stories of our indigenous ancestors, songs of suffering, redemption, and freedom She holds and flows into our present day reality. We as community, as yogis, have the privilege of tapping into Her wisdom and creative inspiration, through our hearts & voices, to help us live in a way that is more harmonious with Her natural rhythm and collaborative ways. Blessed be. Join before February 10 and get $5 off your Bhakti Bliss. Amy Barnes is a real living carrier of the TRUE ROOTS MOJO! She is kind, dedicated, sensual, inspired and inspiring. Her life and personality are richly soaked in the magical nectar of the Divine … which overflows in her music and teaching. She has a great and ever-growing GIFT to share and the world is ever-more Blessed as she shares IT! A note to Amy’s mother … P.S. Amy’s workshop on Sunday was a nice gift of time and energy on a busy day and the first Sunday of Advent. She is, like you, both amazing and inspiring in many ways – both of you have the most wonderful eyes and smiles and helpful voices. Thank you again for shining your beautiful light with your yoga, your song, your energy ~ it is an incredible sensation to gather together and sing God’s names. It is powerful and think of how much of it you spread around by charging & waking up us lucky & blessed beings. Nashville is a better place to live because of it! When we sang “shakti shakti shakti” wooh! I had a surge up my left side. Good stuff honey ~ I will be there for the fire ceremony, thank you for passing it along ~ and for helping me to open up more fully to life … my heart. I have taken your class several times at Sanctuary and have come to two of your kirtans. I am moving back home to NYC in a week, and will unfortunately miss the upcoming kirtan. I just wanted you to know I think you are one of the most lovely and fantastic teachers out there. Your classes are absolutely uplifting and renewing and every other superlative that one associates with the best teaching! It is clear that your students love you and that you love what you do. I just wanted to send you a quick note of appreciation for this afternoon’s amazing experience. You must know what incredible gifts and talents you possess, truly. And to share them as openly as you do is really a blessing for all who are there to participate. I was especially intrigued by the meditation you introduced … disrupting the ruts of our minds and body. I had a recent experience of energy work and was told all my energy stays in my head-that I have created ‘ruts’ of mind activity. Must be a word for me to pay attention to. Amy Barnes, thank you for sharing your intuition, experiences, and touch. You are making a difference. It is sort of like “Yoga-church” for me since I no longer attend an organized worship place. I have had more spiritual events or feelings attending Kirtan than all my years of Church or Bible College. Telling my family and Pastor this was like coming out of the closet … But all have given me their happiness for me in finding my Spiritual path. I was deeply touched, inspired and uplifted by your gorgeous bhakti yoga. WOW! I felt as though I was swimming in pure bliss. My practice has been enriched and renewed and I cannot wait to do it all again. I thank you forever for that marvelous heart-and-spirit song of a day. Amy, I was, and am, deeply moved by your workshop on Sunday. To make a long story shorter, since Sunday, I am able to see the situations/patterns that have been holding me a hostage of depression and anxiety as an observer, and instead of being ‘sucked into’ old patterns, I am rising out of them (finally!). Thank you for holding a beautiful space for me and the others last Sunday. There is always the need to unwind, to go deeper into oneself and renew energy for life and purpose. Amy’s Bhakti weekend offered an autumn feast of yoga body movement and heartfelt song and ceremony. All of this was facilitated by the workshops’ community which was created by mutual desire for deep connection with the earth and the divine in ourselves, and each other. Amy’s facilitation moves from an immediate synthesis of ancient rhythms of life wisdom and modern demands for rejuvenation and relevance. She leads us with an earthy elegance of body and spirit, and her voice in the Kirtan, call and response songs of praise, is an exquisite blend of beauty and lightness and the grit of longing for union. Her offerings are a rare opportunity to move, personally and globally, into a life of more joy, awareness and wholeness. A bhakti yoga weekend retreat with Amy Barnes more than amazed me. It fulfilled my deepest desire to find a teacher of the yoga path that lights up my soul fire…and right here in Tennessee ! How wonderful indeed! Her “bhakti soup” cooks up so artfully the blend of yogas – the fluid, flowing hatha, pranayama breathing, repetition of mantras to music, and the bhakti, the yoga of love and devotion expressed through her presence, voice and healing touch. It makes for a totally unique and integrated experience that took many if not all of the participants, myself included, to new highs, expansions, and ecstasy. I’ve been up close to many masters and heavy-duty spiritual teachers, feeling their darshan. The feeling that Amy exudes is right up there with the best of them, imbued with her special musical talent and the vibrations of all of her teachers, and the delightful essence of Shakti. We are very fortunate to have her presence in our area. If passion for the Divine is your calling, she might just be the one with whom to fly to the Higher Planes of existence.